Min. 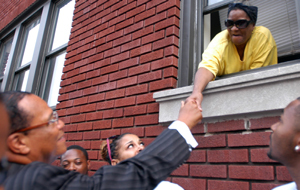 Farrakhan greets young man in Chicago’s South Shore neighborhood during Monday night mass mobilization of Nation of Islam men across the country. Droves of strong young Black men were embraced by Min. Farrakhan. Many excitedly used cell phone cameras to capture the touching moments. 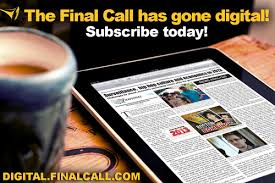 CHICAGO (FinalCall.com) - Gripping stories are pouring in since Nation of Islam men mass mobilized to take a message of redemption to the troubled inner cities, suffering suburbs and rural towns of America and faraway places like Montreal, Canada, Port-of-Spain in Trinidad and London, England. 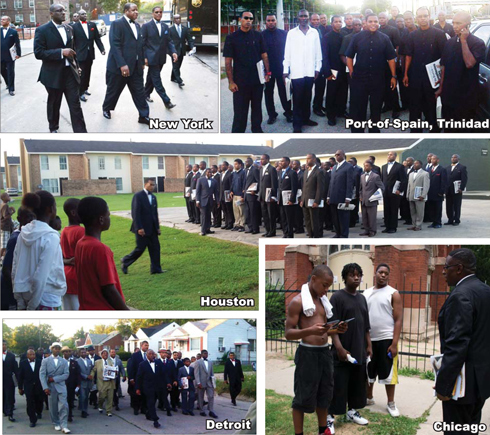 From North to South and East to West, the Fruit of Islam men have followed the example and guidance of the Honorable Minister Louis Farrakhan by going into what are called the worst neighborhoods on a mission to promote peace and respect for life. Majied Muhammad of Detroit’s Muhammad Mosque No. 1 has been in the Nation of Islam since 1967. 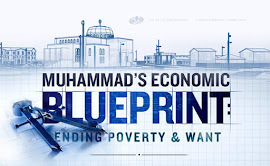 Although it is sad to see the condition Detroit is in, the teachings of the Most Honorable Elijah Muhammad will prove to be the answer, he said. Smiling woman shakes the Minister’s hand in an area known as “Terror Town” due to problems with crime and violence. Residents embraced Min. 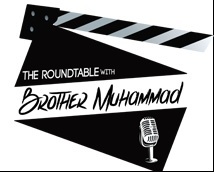 Farrakhan and the Muslims engaged in outreach and efforts to promote peace. 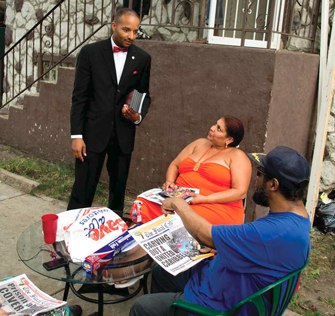 The Fruit of Islam were very well received in the city’s troubled neighborhoods and Muslims are working to strengthen relationships with community residents and business owners, Majied Muhammad continued. For veteran Nation of Islam member Amin Muhammad, whose daughter is enrolled in Cuba’s medical training program, going to the streets reminded him of the early days of rebuilding the Nation of Islam in Washington, D.C.
“I was the first officer then and the Minister was traveling doing lectures like True Christian Love and With Christ All things Are Possible,” he recalled. “Going out now we see women crying and almost giving their sons to us. Each time we go it also reminds me of the Million Man March. Our presence hits them in a way that just brings forth love. God’s hand is directly on us. It’s affecting not only the community but us as well. Each week we have nearly 100 men and it’s not the same group. It’s causing brothers to come back to the ranks,” he said. The Fruit of Islam in the District of Columbia visited the Carver Terrace and Langston Terrace housing complexes. “We have a Thursday night study group there,” explained Abdul Khadir Muhammad, who oversees Muhammad Mosque No. 4 in D.C. and is a regional student minister. A few hours South of Washington, D.C., down Interstate 95, is Atlanta. The F.O.I. in the city went back to a community and visited a family whose son was killed 18-months-ago. After the young man’s funeral, Southern Regional Student Minister Abdul Sharrieff Muhammad sent staff to comfort the family and see if anything else could be done. A member of the F.O.I. lined 20-30 children up and called military drill cadence, teaching the children to march. The children responded with obedience, discipline and pride. 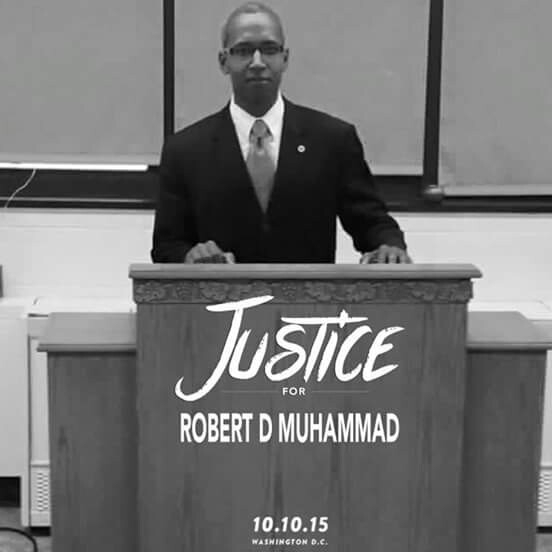 Abdul Hafeez Muhammad, New York representative of the Nation of Islam’s Muhammad Mosque No. 7, took the men to the site of the legendary Rucker basketball tournament in Harlem. Things were peaceful while the Muslims were on scene but a little over an hour after the F.O.I. departed, a teenage boy and four others in their 20s were shot following a melee. The previous night, four-year-old Lloyd Morgan Jr. was shot after a gunfight broke out in the Bronx. Saying there is still much work to do, Abdul Hafeez Muhammad shared heartfelt sympathy for the family of 21-year-old Matt Shaw, who graduated with a degree in business in May and shot to death June 4. During Monday night mass mobilizations, two F.O.I. knocked on the door of a man who lost his 13-year-old daughter, shot by her own brother at the Polo Grounds across the street from Rucker Park. Darius Muhammad led the F.O.I. of Youngstown, Ohio to Warren, Ohio, a town where a 16-year-old was recently shot across the street from a church. Church members were very resistant to F.O.I. efforts to connect and help, he said. The resistance only motivated the men to try harder to reach out to the community. Omar Muhammad of Chicago’s Mosque Maryam was with Minister Farrakhan July 23 as he walked the streets of “Terror Town” in the South Shore neighborhood. At basketball courts near Rainbow Beach, Omar Muhammad saw a young member of the Black Disciples street organization playing basketball. The Muslim encouraged the young man to meet Min. Farrakhan, but could not understand why he was hesitant. “I said, ‘Come on man, you got to come meet the Minister!’ So he said, ‘Ok.’ And as he was walking with me he said, ‘Man, my hands are not even clean enough to touch the Minister’s hands,’” Omar Muhammad said. Min. Farrakhan walked the streets for two consecutive Mondays July 16 and July 23 in the Auburn-Gresham, Englewood and South Shore neighborhoods. Chicago has seen a 40 percent spike in homicides, with children killed, multiple victims shot over weekends and an outpouring of despair. While the prayers and kind words expressed are appreciated, the Minister has been clear on the purpose and motivation for the turning out hundreds of men on Monday nights. Mondays are the nights for the Nation’s men’s training class and the Minister has brought those classes out of buildings and into the streets. 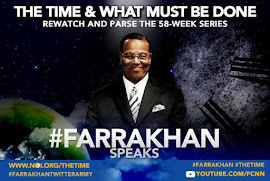 “We do not do what we do seeking any honor or praise, for all honor and praise belongs to Almighty God Allah,” wrote Minister Farrakhan in a special letter published in the July 23 edition of The Final Call. “There were good words written and spoken about our initial effort by members of the press, by members of the city government, by members of the police community and by the common people. Although we appreciate that, the Honorable Elijah Muhammad said to us, ‘Honor is never truly given until the work is done.’ We have just started so although we are grateful for the good words and thoughts, we must do the work and let the honor come from God,” he said. Still opponents of the Minister and Nation have not stopped efforts to derail peacemaking before it gets a good start or sets down strong roots. F.O.I. prepare for work in the community. Chicago Mayor Rahm Emanuel was taken to task by members of the Jewish community for acknowledging the Nation of Islam’s role in working for peace. “The police have a role to play. Tearing down abandoned buildings has a role to play. Shutting liquor stores that are a cancer in the community have a role to play. Community leaders have a role to play. Pastors have a role to play. Principals have a role to play. And most importantly, parents have roles to play. 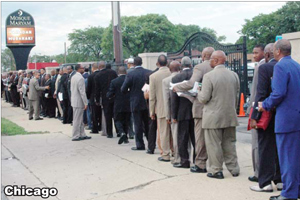 They have decided, the Nation of Islam, to help protect the community. And that’s an important ingredient, like all the other aspects of protecting a neighborhood,” said Mayor Emanuel, who is Jewish. Alderman Carrie Austin, who represents a Chicago ward with serious violence problems, told The Final Call remarks she made to a Chicago Sun-Times reporter were misconstrued. While the article appeared to express negative comments, Alderman Austin expressed deep respect for the Minister and pleaded for help from the Nation of Islam. Alderman Austin stressed her frustration with the deaths of young people and the inability of anyone to stop it. Three years ago the videotaped beating death of a teenager brought mass media attention to her ward. But, she said, the media has left and does nothing to help. Instead the reporter wanted to raise questions about Black-Jewish conflicts, which the alderman declined to participate in. “A young man just walked into Roseland Hospital today with a Uzi to kill an old man, a 65-year-old man. You have no more respect for life than that? I don’t know what else to do. So if Minister Farrakhan has a solution for my kids dying the streets, I welcome anybody’s help,” Alderman Austin said July 27. She also called the Fruit of Islam disciplined and intelligent men who are needed in her area. On the West Coast, community members also felt joy seeing the men of the F.O.I. in the streets. “Seeing the tears in two elderly grandmothers’ faces as they verbalized the strength in unity that they saw in the F.O.I. in the streets was very heartwarming,” said Daniel Muhammad of the Long Beach Study Group. Stancy Muhammad of Muhammad Mosque No. 75 in Las Vegas shared how one businessman described the presence of the F.O.I. as “a refreshing drink of water to have on these Mondays. One elderly sister came out of her house and saw the brothers and was so excited that she yelled ‘Allah hu Akbar!’ She yelled to the community, ‘These brothers are saving souls.’ The children were clapping for us. They said ‘We love you!’ to the F.O.I. It just felt good to see the community receive us so well,” said Stancy Muhammad. Allah hu Akbar! is an Arabic term that means God is great. In Houston, the F.O.I. from Muhammad Mosque No. 45 went into a neighborhood considered by the Harris County constable’s office as one of the highest crime-ridden spots in the city. Armed with The Final Call newspaper and bright smiles, the Muslims went door to door in Crestmont Village and Villa Americana apartment complexes located at Martin Luther King Boulevard and Selinsky Road. 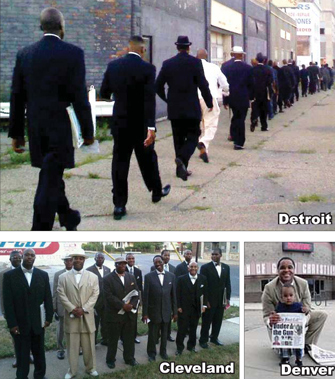 Residents of all ages were excited to see the men and shared how badly the Nation of Islam’s presence is needed. Young people pulled out their cell phones to capture the Muslims performing military drill movements. A few joined the ranks as Student Southwest Region Minister Robert Muhammad called cadence, or commands for movement. “This is the best thing that has happened to my ‘hood since I was a kid,” said one young man. 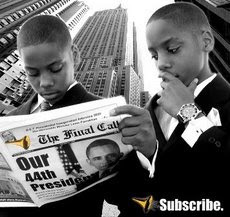 Stories have also come in via the Nation of Islam’s social media networks. In a Facebook posting, Abdul Tahir Rahman described an experience when the F.O.I. visited the Cypress Hill Projects in Brooklyn. An older woman described how young Black males just hang out and “do a lot of dangerous things,” he said. In another Facebook post, Jeffrey B. Muhammad of the Muhammad Study Group of Austin, Texas described a moment that almost brought him to tears. As the F.O.I. moved through the streets, they came across two men and a women behind a fence in an alley. As the Muslims came forward, the trio put their hands up and said, “Please don’t come over here!” The Muslims continued moving forward and the men put down their drinks, switched their smokes to another hand and greeted the Muslims. “When I turned to the sister, she said in a meek little voice, ‘Please don’t, I smoke crack’... as if to imply she is unworthy of anything, I bent down slightly to lift up her eyes with my eyes, smiled and said, ‘Sister, you are so beautiful, I see God in you, and I am so honored to meet you.’ She slowly tilted her head, and stared into my eyes as if she has never looked into anyone’s eyes before. For the next few seconds, I could see her saying thank you even though she didn’t say a word, but with an expression of gratitude that only her eyes could tell. 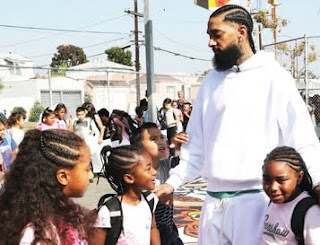 Then it hit me, emotionally ... this is the Love that Jesus spoke of, and I am thankful that Minister Farrakhan led me to it,” Jeffrey Muhammad wrote.